Manpower refers to all the staff who is appointed in different positions for performing administrative, clerical, as well as technical jobs. It is also known as office personnel. Manpower is the only living resources which utilize other resources in order to perform official activities. The organization should estimate a suitable number of staff for a given period. The act of estimating the required number of staff in different positions of the organization is called Darbandi. It avoids the situation of over and understaffing and helps in controlling labor cost. 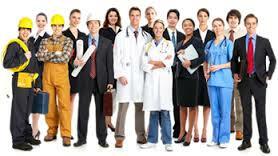 The manpower can be divided into administrative and technical according to the nature of jobs to be performed. Administrative manpower: The manpower who involves in preparing plans and policies, implementing them into practice and controlling whole activities of the organization is called administrative manpower. They perform administrative as well as clerical works. They perform a specific job and do not require specialized knowledge and skill to perform such job. They prepare plans and policies and implement them into practice. They direct, communicate, coordinate and control the activities of the organization. The office chief and office assistant are the examples of administrative manpower. Technical manpower: The manpower who have specialized knowledge and skill required to perform a specific job is called a technical manpower. The technical manpower requires specialized knowledge and skill to perform it. The office appoints skilled, semi-skilled technical manpower as per its requirement. The staff who are highly experienced, trained and have specialized knowledge are skilled manpower. The semi-skilled manpower does not have the same degree of experience, training, and knowledge as the skilled manpower have. They assist to the skilled manpower to perform a specific technical job. Similarly, unskilled manpower is that staff who do not have any specialized knowledge and training but assist the skilled and semi-skilled manpower to perform a specific job. Manpower development is an act of updating present manpower for performing future work in the changing environment by increasing knowledge, skills and capacities of the employees. It refers to the task of updating the present manpower. It is the process of preparing manpower to cope with the changes in the organizational environment. It is concerned with increasing the knowledge, skills, attitudes and capabilities of the present staff of the organization. It helps in preparing the staff to work effectively and efficiently in the organization. It enhances personal competencies required to perform present and future jobs. The manpower development is done through training program, seminar, workshop and field visits. It can also be done by providing an opportunity for future studies, making the evaluation of performance and proper counseling of the employees. Manpower refers to all the staff who is appointed in different positions for performing administrative, clerical as well as technical jobs. Administrative manpower and technical manpower are two types of manpower. Manpower development is an act of updating present manpower for performing future work in the changing environment by increasing knowledge, skills and capacities of the employees. Write short note on manpower development. Manpower is also known as ______. An act of updating present manpower for performing future work in the changing environment by increasing knowledge, skills and capacities of the employees is known as _____. The manpower who involves in preparing plans and policies, implementing them into practice and controlling whole activities of the organization is called ______. The manpower who have specialized knowledge and skill required to perform a specific job is called a ______. The manpower development is done through______. Any Questions on 'Types of Office Resources (Manpower) '?